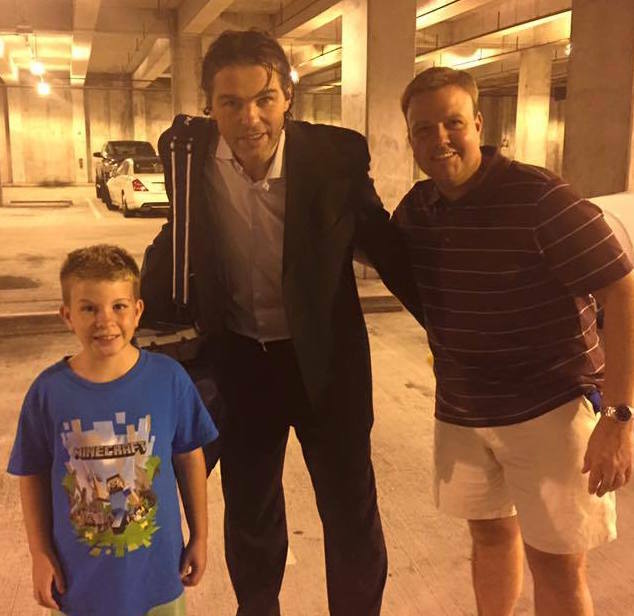 Here is an original photo of the ageless Jaromir Jagr posing with fans in the parking structure of the BB&T Center, the Florida Panthers’ Sunrise, Florida home arena. The shot is provided by Bob Cushing. Remarkably, the soon-to-be 44-year-old Jagr is skating in his 26th professional season, 22 of which have been spent in the NHL, amid 8 different organizations. The native of the Czech Republic also skated for an assortment of European professional teams. The now 13-time All-Star (recently selected to this year’s game) has the led the NHL in points 5 times, ranking 4th all-time in goals and 6th all-time in assists. During his first 2 seasons in the NHL, Jagr was an integral part of the Pittsburgh Penguins back-to-back Stanley Cup champion teams. He also led the Czech Republic to a Gold Medal in the 1998 Winter Olympics.